Games can challenge us, sparking our problem-solving skills into action, and they can relax us. They make us laugh, and let us connect with friends. They let us burn off steam when we're frustrated or angry, and sometimes we even learn something about ourselves through playing them. If you have an Apple iPhone, you can use games for all these purposes, no matter where you are. From the tons of available games this time, we have selected the best mind relaxing game for you that is peaceful in its way of presentation. Guys we are talking about, Campfire's Burning. 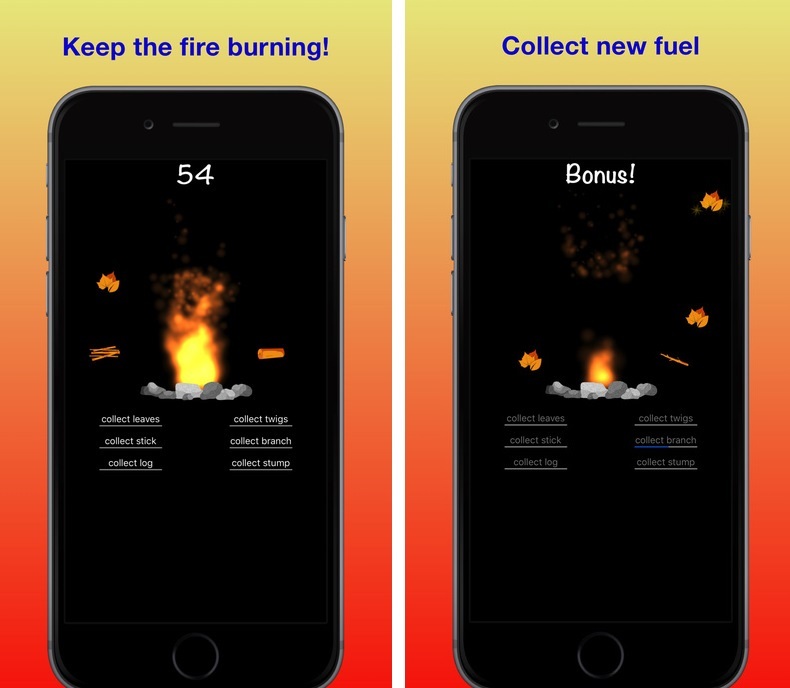 Campfire's Burning is the game, where your job is to keep the campfire burning. The game is simple one touch control and easy to use. When you start the game, you will see the bone fire on the screen and some objects like dry leaves, sticks, logs and many other things free falling on the screen you have to collect these objects to keep the campfire alive for as long as you can. Every second of the game, you are rewarded with some gold coins for alighting the fire. You can use these coins to boost you game play as; increase the inventory for your collected objects and make your game play faster regarding collecting these free falling objects. The graphics are so cool and they definably relieve your mind from all the stresses and keep you back in the track. Try this game before you are going to sleep and you will surely find good results. Download it today free for you iOS devices and have a lot of fun.